There are currently 114,874 users on this website. 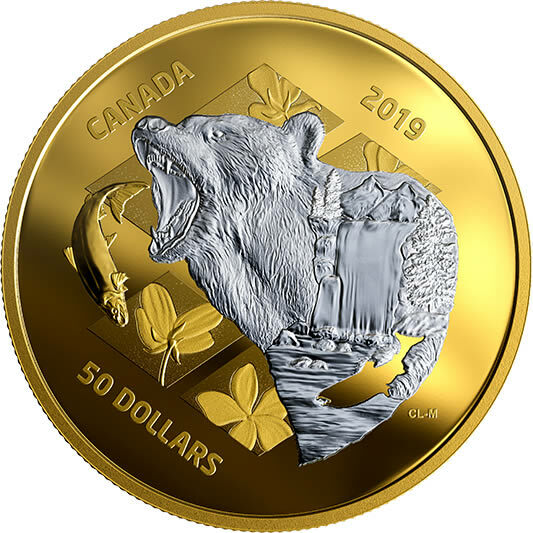 Royal Canadian Mint - Designed by Canadian artist Caitlin Lindstrom-Milne, your coin features an upper-body portrait of a grizzly bear against a gold-plated background of Canada violets within a series of squares. A sockeye salmon swerves in front of the bear's muzzle that is wide open in an attempt to catch the fish. A waterfall with distant mountains is engraved within the bear's silhouette. Rocks protrude from the water and line the riverbank where evergreens grow. "CANADA 2019 50 DOLLARS" appears in the lower left quadrant of the design. Its engraving echoes the curved shape of a swimming salmon. On the obverse, the effigy of Her Majesty Queen Elizabeth II by Susanna Blunt with "ELIZABETH II D.G. REGINA" engraved along the outer edge of the coin.